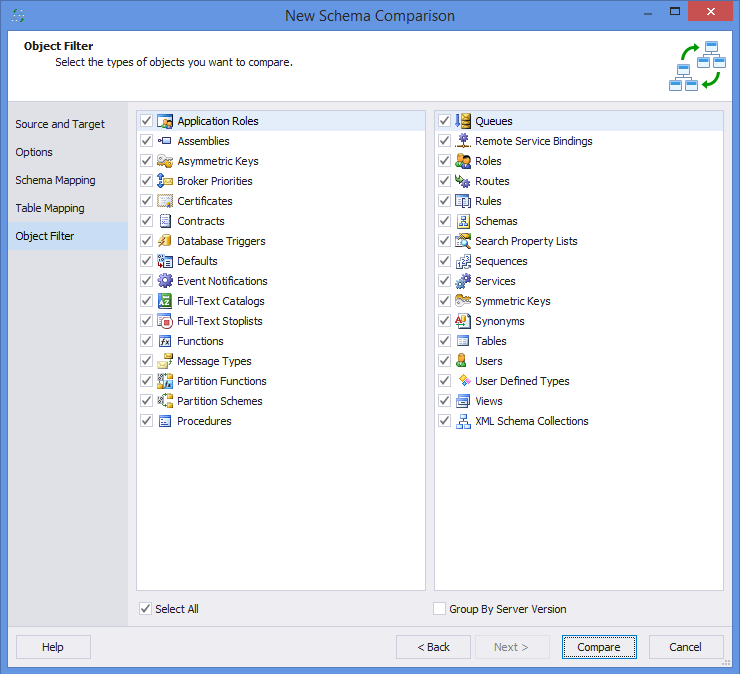 Learn how dbForge Schema Compare for SQL Server makes schema comparison and synchronization easy and fast. When you run Schema Compare, it automatically opens the Start page with quick access links to main features of the tool. Moreover, the Start page shows a list of your recent comparison projects which you can open at one stroke. Click New in theNew Schema Comparison wizard – the Database Connection Properties window appears. Specify the required server connection properties and click OK.
Come back to the wizard and select this connection from the drop-down list of the Connection field. Target is the database that is updated (synchronized) with the results of schema comparison to make it the same as Source. In dbForge Schema Compare for SQL Server, you can compare the following Source and Target types: Database, Backup, Scripts folder, Source control, and Snapshot. To swap Source and Target, click Swap. To set up additional comparison options, click Next. To start the comparison, click Compare. Optionally, you can customize comparison behavior, such as ignore some objects or properties. Go to the Options wizard page and select the required check boxes. Save your comparison settings as to a command line arguments file by clicking the link at the top. Later you can use this file for automatic comparison and synchronization through the command line. To save the current selection of options as your defaults, click Save As My Defaults. If you need to map schemas (with different names, one-to-many, or many-to-one), you can do it on the Schema Mapping wizard page. Select a source schema and target schema, and click Compare – the schema objects will be mapped automatically. To speed up comparison and save your time, select only the required object types on the Object Filter wizard page. Tip: By default, all supported objects are compared. The Schema Comparison window displays the grid with detailed information about the objects compared. The objects are grouped by status (Only in source, Only in target, Different, Equal). You can re-group them. Select an object to see the structure differences between Target and Source in the window under the grid. For synchronization, you can exclude differences that you do not want to synchronize by unselecting the check box next to a corresponding object. Group and filter the objects in the grid, e.g., to see only different objects. Preview the synchronization script fragment for each object to make sure that you get the desired synchronization result. On the Schema Synchronization Wizard page, you can generate a synchronization script and tune the synchronization results based on your needs. Click Synchronize to immediately generate the synchronization script. Go to the Options page to customize the synchronization by applying various options. Open the Dependencies page to check the objects used by one or more objects included in the synchronization. On the Issues page, you can resolve certain synchronization-related issues. To see the synchronization actions and warnings generated during mapping, move to the Summary page. Use SQL editor to view and edit synchronization scripts, create queries and execute them against the selected database. To open SQL editor, click New SQL on the toolbar. Query results are displayed in the Data window at the bottom. Find rich data management options in the context menu.